2017 has been a helluva rollercoaster trip for us. Music blogging on Lie In The Sound isn't the only white elefant in our lives and by far not the biggest. We have been active refugee supporters for quite some years but we never expected our lives to be turned upsite down the way it happened. At the moment we are in need of financial support for our dear friend Adam as well as Fatima + Ali and their 7 children. 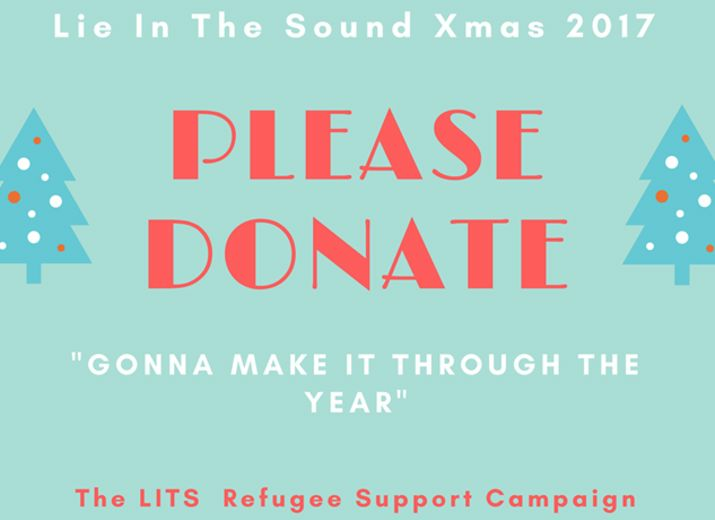 If you can make a donation "Gonna Make It Through The Year" LITS Refugee Support Campaign, it would really, really help a lot! By the way, Leetchi is a really trustworthy platform. 2 years ago Fatima and Adam have both been featured by the English languaged magazine. That's not how we got to know them though. Late September 2016 whilst browsing through Facebook Brigitte found the urgent scream for help of a young African refugee. He had gotten his deportation note with a fix date, time and already booked flight. A year later he is still living in Berlin (Germany). It's been quite a task but we managed to stop the deportation. Adam has grown to be family for us. We are still fighting to get him a full legal status. At the moment he only has a "ban of deportation" (German: Duldung). He's not allowed to work nor go to school. He's going to a school run by volunteers though. Adam is part of a group which is under special protection from the protestant church. This doesn't keep him safe from harm but gives us hope and some support to build a future for him. At the moment we are paying for a room in a shared flat and there's other expenses for things like meds, tickets for public transportation. We also help his mother and sister, who live in a refugee camp in Darfur (Sudan). Adam's father died while fighting againts the armee of the dictator of Chad. Neither Adam nor his mother and sister can go back to Chad as their family is well known for being part of the political opposition. This fall Adam introduced us to Ali + Fatima and their seven beautiful children. Their situation is difficult to say the least. We are still busy doing all the research to fully understand the legal aspects. At the moment they are put up in a refugee shelter outside of Berlin. The whole family of nine people has only two rooms. We are trying to find a flat for them. This means we have tons of appointments at different public offices, that's why we need money to buy train tickets. We also need money to fund a good lawyer for them. Anyway, we had to write a whole book to describe everything we are doing. Actually we are supporting way more people but Adam, Fatima + Ali and their kids are the most important people for us. If you have any questions feel free to ask us. We happily explain more about our refugee friends situation and our support.